How unkind of snail to go off without you! It would be so much more fun to have you two along! Snail doesn't know what he is missing not taking the two of you with him. Try not to think about it, and look forward to the surprises he will bring back for you 2 sweethearts. Snail is sooo lucky. I hope he sends you a postcard. Yup, that's what snails are like. On the other hand: if you have a mobile home, you might as well use it. Maybe he'll bring you back a T-Shirt! Snail must be having the time of his life. Hopefully he'll bring home some nice things for you two! I think Snail put Daisy up to tricking Harley into thinking something else. Snail went without you? How dare he? We hope Mr. Shrill didn't go with him. that snail is not very nice is he. That darn snail went without you. That is terrible. You need to give him a bitey when he gets home. Daisy, that is a very silly picture of you in the first one. Mom got a chuckle out of your relaxed position. Hope you all have a wonderful week. Have fun, Snail! Be sure to ride "It's a Small World"!!! WE HOPE THAT SNAIL HAS FUN!!!!! Now what did snail do that was so great that he can go to Disney World? 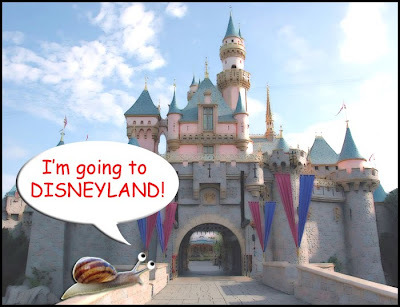 Snail is very lucky he went to Disneyland...and good that he didn't come visit us instead...Jonesie has a war on slugs now, and snails are on her list as well. I hope he has a long vacation. It'll take a while him to get there. Aw and he didn't tell you?! Hope you've got something planned in revenge!!! We hope snail will show you his photographs when he gets home. i can't wait to see what snail looks like in big mouse ears. That was very mean of snail to go without you. That news hit him pretty hard. I'm sure snail won't have as much fun without the two of you. Good for snail! Although since you must be "this tall to ride"...he might be out of luck. Good for you Mr. Snail...don't forget to bring back souvenirs for Daisy and Harley! That would be a very fun vacation for Mr. Snail! We're sure snail will have a "shell" of a time in Disney Land! hehe u had us worried there! Must have taken snail a looong time to get there!!!! Oh man! That is so unfair! You should be along. ooooooooo we can't wait to see his mouse ears hat! wait for me, snail!! i'll bring the sun screen, and extra butter and garlic for you!! Oh how could snail be so mean to go to Disneyland without you!! Well that's rude of snail. That was a little bit rude of him! But maybe he'll bring you back some wonderful presents. Hello Snail, you made it to Dineyland and I'm still in Dallas! Hmmm, do you think Snail will see Tigger? 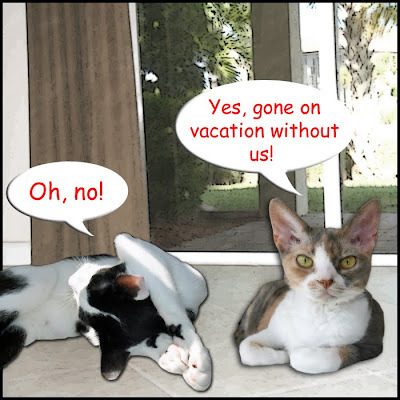 Meowm says she wants to go with snail!!! Course, she would have to take all of us too!! Did someone go with Snail? He's aweful little to be wandering around by himself! Geesh even snail gets to go to Disney. I must be the only one left that's never been there. Sorry Harley, snails get to have all the fun! 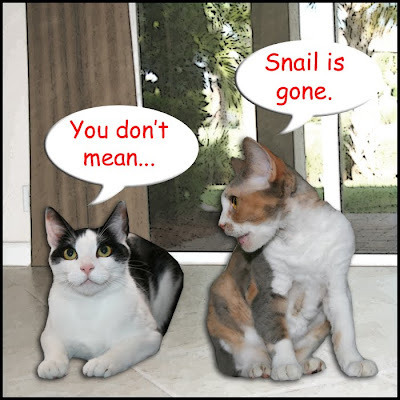 That wasn't very nice of snail to go off without saying goodbye. Oh well, I hope he has a good baycation. That wasn't nice of snail to go see Mickey without you! It's going to take him a long time to get to California too. Maybe you two can go see Mickey in Orlando! Buddy Bear said: "So sorry you din't get to go on the trip with Snail. Maybe nex times? Snail You bes gets some souvenirs for those two. Me and da MikiCato, Tegar, Rowdy, Lady Smokey and da Queen kitty, Miss Spooky hope you have fun." What?!!! Going to the Disney Land without you???!!! Well, that wasn't very nice of Snail to go off to Disneyworld without you!! 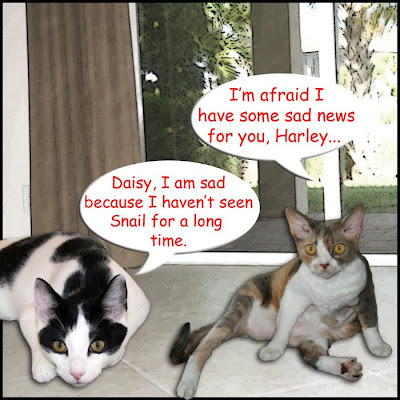 have fun Snail, but you should have taken Daisy and Harley with you! Well, Snail had better bring t-shirts and souvenirs when he gets back. Oh no!!! That is not fair that he went to Disneyland without you two!! It's the most crowdedest place on earth! For one awful minute we fort snail had kicked the bucket! Well, I hope Snail at least brings you some cool souvenirs. Harley looks really devastated! We are SO happy for Mr Snail! What century will he arrive there?